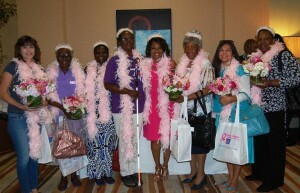 Breast cancer survivors attended a kick-off rally for this event at the Embassy Suites. PALMDALE – In recognition of National Breast Cancer Awareness Month, the American Cancer Society is inviting the Antelope Valley community to its inaugural Making Strides Against Breast Cancer event. The 5K noncompetitive walk will take place on Saturday, Oct. 19, at the Palmdale Amphitheatre/Marie Kerr Park, located at 2723 West Rancho Vista Boulevard. Registration begins at 7 a.m. and the walk starts at 8 a.m. Hundreds of walkers are expected to gather for the national crusade to raise awareness and funds to fight against breast cancer. As of Thursday afternoon, 61 teams and 497 participants had already raised more than $24,000 in support of the event. Funds raised from the walk will help the American Cancer Society provide free information and services for those living with breast cancer in the Antelope Valley. Breast cancer remains the number one public health concern facing women today, and the American Cancer Society’s Making Strides against Breast Cancer walk has changed the face of breast cancer in communities nationwide by funding cutting edge research, advocating for all women to have access to mammograms and treatments, and providing free local educational programs and supportive services. To learn more about the American Cancer Society or how to form a team for Saturday’s event, call 1-800-227-2345, visit makingstrides.acsevents.org, or contact event chair Ima Moore at emooreno4@msn.com.